The SPRINT Trial was an important trial for the evidence base in hypertension. Previous studies had shown that intensive BP lowering in patients with type 2 diabetes (<120 vs <140 mm Hg) and in patients who previously had a stroke (<130 vs <150 mm Hg) resulted in no significant benefit in major cardiovascular events (except for stroke in diabetics). The natural question arose about whether tight BP control in patients without diabetes or previous stroke mattered more than less intensive control? This became even more important as JNC-8 recommended less stringent goals than previous JNC guidelines. Unfortunately I have seen physicians I work with and residents become overzealous in extending SPRINT results to other patient groups, especially those which it excluded. Interestingly, when I question them about SPRINT and who was actually studied they either assumed it was all patients with HTN (because they hadn’t actually read the inclusion/exclusion criteria at all) or knew who it was restricted to but assumed that higher risk patients with diabetes and stroke would equally gain benefit (or even more which seems intuitive). So my 1st point to make is that you should actually read a study and know who was studied (and importantly who wasn’t) before you start using it. This seems like an intuitive statement but many of my colleagues and trainees simply haven’t closely examined the study. They have heard abbreviated results in conferences or from faculty in clinic and assume that it applies broadly. So who was in SPRINT? To be included a patient had to be at least 50 yrs of age, have a systolic BP of 130-180 mm Hg, and be at increased risk of cardiovascular disease (clinical or subclinical CVD, CKD with eGFR 20-59 ml/min, Framingham 10-yr risk >15%, or be over 75 yrs of age). Patients with diabetes and prior stroke were excluded. Lets see what they looked like by checking out Table 1. These patients had pretty good baseline blood pressures and were already on almost 2 anti-hypertensive meds to start. They had fairly good lipid profiles and around 43% were on statins. The majority were nonsmokers and had 20% 10-yr Framingham risk. These patients are somewhat healthier than the patients I see. Point 2: Compare patients in the study to who you see. Are they sicker or healthier? How would you adjust the results to fit your patients? Don’t assume the study enrolled the average patient or that your patients will be just like those in the study. In Part 2 I’ll analyze the intervention and outcome measures of the study. Should we stop treating mild (stage 1) hypertension? I am preparing for a talk on the controversy surrounding JNC-8 and came across a post on KevinMD.com by an author of a Cochrane systematic review that aimed to quantify the effects of antihypertensive drug therapy on mortality and morbidity in adults with mild hypertension (systolic blood pressure (BP) 140-159 mmHg and/or diastolic BP 90-99 mmHg) and without cardiovascular disease. This is an important endeavor because the majority of people we consider treating for mild hypertension have no underlying cardiovascular disease. The JNC-8 authors simply ignored a systematic review that I co-authored in the Cochrane Database of Systematic Reviews that found no evidence supporting drug treatment for patients of any age with mild hypertension (SBP: 140-159 and/or DBP 90-99) and no previous cardiovascular disease, diabetes, or renal disease (i.e., low risk). Let’s see if you agree with his assessment of the findings of his systematic review. As is typical for a Cochrane review the methods are impeccable so we don’t need to critically appraise the review and can review the results. The following images are figures from the review. Examine them and then I will discuss my take on the results. 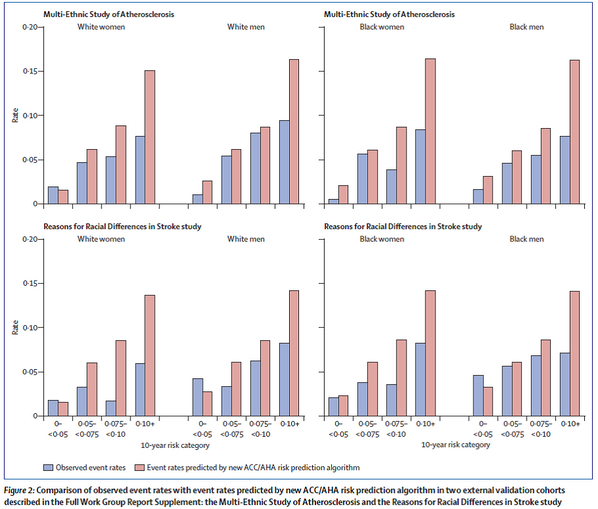 If you just look at the summary point estimates (black diamonds) you would conclude the treatment of mild hypertension in adults without cardiovascular disease has no effect on mortality, stroke and coronary heart disease but greatly increases withdrawal from the study due to adverse effects. But you are a smarter audience than this. The real crux is in the studies listed and examination of the confidence intervals. Lets examine stroke closely. 3 studies were included that examined the treatment of mild hypertension on stroke outcomes. Two of the studies had no stroke outcomes at all. The majority of the data came from one study. The point estimate of effect was in fact a reduction of stroke by 49% but the confidence interval included 1.0 so not statistically significant. But the confidence interval ranged from 0.24-1.08- a potential 76% reduction in stroke up to an 8% increase. I would argue that a clinically important effect (stroke reduction) is very possible and had the studies been higher powered we would have seen a statistically significant reduction also. I think to suggest no effect on stroke is misleading. The same can be said for mortality. Finally, what about withdrawals due to adverse effects. Only 1 study provided any data. It has an impressive risk ratio of 4.80 (almost 5 fold increased risk of stopping the drugs due to adverse effects). But the absolute risk increase is only 9% (NNH 11). We are not told what these adverse effects are to know if they were clinically worrisome or just nuisances for patients. So, I don’t agree with Dr. Cundiff’s assessment that there is no evidence supporting treatment. I think the evidence is weak but there is no strong evidence to say we shouldn’t treat mild hypertension. The confidence intervals include clinically important benefits to patients. More studies are needed but will not be forthcoming. Observational data supports treating this group of patients and may have to be relied upon in making clinical recommendations.